As you approach the Rijksmuseum in Amsterdam, you're greeted by a giant banner showing a red X over a camera. While the prohibition of photography is not unusual in certain exhibits, in this day and age of the #artselfie this museum-wide discouragement (although not banning) of photography has caused a bit of an uproar. It's part of the museum's #hierteekenen ("start drawing") campaign, which kicked off with the weekend-long event The Big Draw back in October, a festival full of drawing lessons and activities throughout the space. Since then, museumgoers have been strongly encouraged to keep their cameras and phones in their pockets during their trip, and instead try drawing the works they're most attracted to. This is especially the case on Saturdays, when visitors can pick up a free sketchbook and pencil to bring with them around the galleries. The intent is to combat what the Rijksmuseum claims to be a tendency for a modern museum visit to be "passive and superficial," with visitors being too distracted to "truly experience beauty, magic, and wonder." As the director, Wim Pijibes, puts it, "In our busy lives we don't always realize how beautiful something can be. We forget how to look really closely. Drawing helps because you see more when you draw." For those that are learning about art, taking the time to sit and study a painting or sculpture enriches their experience with art and deepens their understanding of the artist's process and journey. The museum is quick to remind everyone that the end result is not what matters here, but more so building that relationship with the work that speaks to you. Instead of rushing through the exhibits taking as many pictures as possible, the challenge forces everyone to slow down and thoroughly appreciate the art they've come to see. But others see this move as a hostile one. When museums can already be viewed as being stuffy and intimidating to anyone who doesn't consider themselves an expert, placing such a higher value on sketching your experience versus photographing it can seem even more exclusionary. It pushes the notion that museum's general disdain for iPhone snapshots and selfie sticks stems from considering these activities to be too lowbrow and of the masses for their hallowed halls of masterpieces. (Although museums that have a ban on selfie sticks point to the safety of the art and other visitors as their primary concern.) It widens the divide even further between those who wish the art world to be only for people who can properly revere it and those who wish it to be more accessible and universal. 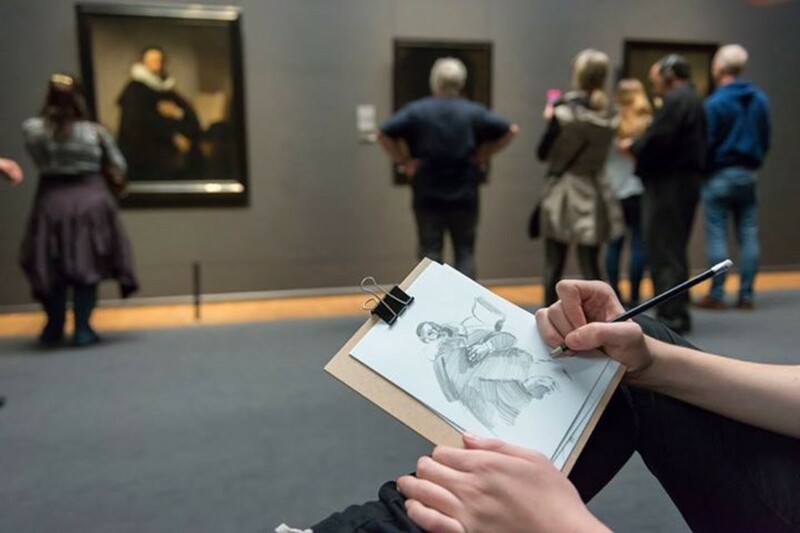 For the Rijksmuseum in particular, though, the Start Drawing campaign has plenty of educational elements, and it can be argued that it further contributes to the goal of using museums as a place to make art more accessible. Not only do the free sketchbooks make them available to those who may not be able to afford them or have a place to get them, but the museum has also set up guided sketching exercises throughout the exhibits that serve as an introduction to drawing and the very act of looking at art. Each stop focuses on a different technique to study in the work and then try out yourself, whether it be line drawing, working with light and shadow, or how to create subtle variations of color. Perhaps people who have seen others drawing in museums and wanted to join but convinced themselves it was only for Serious Artists to do will now feel more comfortable trying it out since they have some guidance. Those artists also have been having mixed reactions. While they certainly appreciate the romanticism of taking your time, sitting in a gallery, and sketching what you see and like the idea of others developing a stronger relationship with art, many have bristled at the suggestion that their photographs are less than other artists' sketches. They recognize the ease of capturing a beautiful piece that pulls you in quickly, and point to a photo's superior ability to save the detail of a work you can only really see and appreciate in person to reference later while they're looking for inspiration. #Hierteekenen. It's a seemingly simple campaign that's unfolding some big questions on the identity, nature, and role of museums in the art world. Where do you stand? At the Staten Island Museum we've been doing this for years: offering clipboards with paper and pencil to observe & draw any of our exhibited objects (we're a general interest museum of art, natural science & history). As a museum goer, I see too many people looking at their cell phones, hardly ever looking at the works themselves, except through a lens. Drawing does make one look more closely. Wonderful - makes one think -- about time, space, the relationship of the eye to the hand or even the eye to the shutter speed of a camera -- not only as a way to view art but a way to create art. Brava!